The foremost promoter in the history of British boxing, Jack Solomons brought top American fighters to England in the post-World War II period, when boxing enthusiasm in that country was at its peak. Solomons spent close to 50 years in the sport, during which he staged 26 title fights. Born into a family of fish marketers, Solomons' first import to Britain was live carp. He became involved in boxing in the 1930s as the manager of Eric Boone and as operator of the Devonshire Club, a boxing venue for up-and-coming London talent. He also worked as a matchmaker for the leading promoters before venturing into his own shows. His first big promotion was the Bruce Woodcock-Jack London British heavyweight title fight. In 1946, when he brought American world light heavyweight champion Gus Lesnevich to England to face Freddie Mills, he opened the door to many more transatlantic matches. 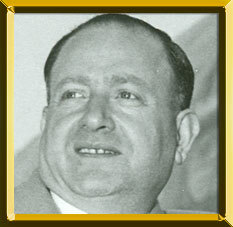 A connection with Hall of Famer Mike Jacobs, then the preeminent American promoter, helped to provide Solomons with the best American talent. Solomons quickly became the most important man in British boxing. He had the best fighters, and he created an air of theatrical excitement around his fights that greatly advanced the sport's popularity. The Sugar Ray Robinson-Randy Turpin middleweight title fight in 1951 was perhaps Solomons's most memorable production. The program cover for this bout showed not the fighters, but Solomon's bow-tie clad, cigar-chomping countenance. Competition and the growth of television gradually reduced Solomons's influence, but he continued to stage many important bouts until his death in 1979. He brought Muhammad Ali (then known as Cassius Clay) to England in 1963 to fight Henry Cooper, and he opened the private World Sporting Club and staged many promotions through its auspices.